Sugarlane Designs: hoo’s finished something at last!!?? Well, it’s just a row……but it’s complete for me anyway…. this little row is for our row by row swap between members in our guild. I had one last row to do and it was for one of the ladies in our group swap….. she was after bright and suitable for a baby quilt.. I think it should be ok…..hoo agrees??? I mean, these little fellas looking at you wouldn’t freak a baby out, would they??? I’m hoping not anyway……and that means I can knock another ‘to do’ off my list ! 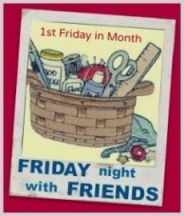 So it being the first Friday of the month, I’m getting something ready for tonight’s FNWF…. Are you going to join with me and so many others worldwide over at Cheryll’s place? Don’t forget to sign up HERE … we’ll have a hoot of a time! I have Tim Tams and MinT SLice all ready. AND I LoVe those owls... my baby is getting owls too. Your friend love "em too. I just love your Owls and think a little one would too. Those owls are so cute, I'm sure the recipient will love them! Very bright little owls, I think they will be very suitable for a baby quilt. Cute owls! Not scary at all and I love the bright colors. Love the owls - what a clever idea for a group quilt! Love these owls! So cute, so fun! Thank you for sharing.